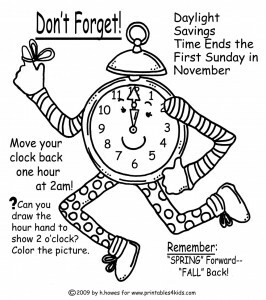 Use this fun coloring page to help your kids, students, friends and family remember to “Fall Back” with the time change on November 6, 2011. You need to turn all the clocks back one hour (if your area had been observing Daylight Savings Time) to go back to Standard Time. Click on the time change picture above to view and print it full size. Be sure to visit us again in the Spring for our Spring Ahead Daylight Savings Reminder coloring page.